So, you’ve decided to take the VCP-NV exam that VMware launched just recently. If you haven’t been living and breathing VMware NSX for the past few months, you’re probably going to need to do some preparation so that you don’t waste the exam fee. Even if you’re an expert, it’s sensible to at least look over the blueprint first and make sure that you have all of the bases covered. Either way, if you want to get this certification then there are three routes that you can take to do it. Before you can earn the certification, you MUST attend the VMware NSX: Install, Configure and Manage course. Then to earn the VCP-NV certification, simply register for and pass the VCPN610 exam. VMware recently implemented a recertification policy. It may change over time (or go away completely) but you need to check and see if your existing VCP is still valid. If it isn’t then you need to go back to option 1. There are optional courses that you can take but to earn the VCP-NV certification, simply register for and pass the VCPN610 exam. If you have one of these four certifications and you’re reading this before 1st March 2015, you fit in here. As far as the VCPN610 exam itself goes, your first step is obtaining the exam blueprint from VMware. This can be found on VMware’s certification page dedicated to the VCP-NV. Starting tomorrow on the #vBrownbag EMEA webinar, we’re starting a series of sessions covering the exam blueprint for the VCPN610 exam. The exam is a required component of the new VCP-NV certification. The first session is being presented by Frank Buechsel (from VMware GSS) who will be covering Objective 1 from the blueprint. I popped by the certification area in hall 7 (behind the HoL) at VMworld Europe today to chat to the lovely people working in VMware’s Education team. One of my primary reasons for going there (aside from getting some badges) was to enquire about progress on the exam track for Network Virtualisation. More on that in a minute. 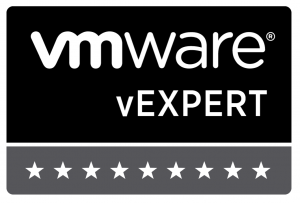 If you’re new to VMware certification or just getting started, there are a couple of good reasons to visit the Education Team whilst at the conference. Firstly they are offering a discount code to take a VMware Certified Associate (VCA) exam if you register for it before November 15th 2013. The VCA certification is VMware’s entry level certification and the exam can be taken online. The current availability and structure of the certification tracks can be seen below. If you want to take your certification further (to get your VCP5-DCV for example) you need to take a VMware course to qualify. The good news is that the required course, VMware vSphere: Install, Configure, Manage, is available as an on-demand classroom course. If you sign up while you’re at VMworld, you can take the course for only $499 and replay it for up to 90 days. Since the ICM course typically goes for upwards of $2000, that represents a big saving. For more details, go to the Certification area and ask for Julie. So, what about the Network Virtualisation exams? No concrete news yet (although I got to meet John Arrasjid, @vcdx001 whilst trying to find that out) but given that NSX went GA today it’ll probably be in the next 3 -6 months. I meant to sit the VCAP5-DCD exam last year after my US project finished and I’d had some time off. For one reason or another it never happened. I managed to book it just after VMworld Europe but then had to cancel again. The other day, I finally got to sit it (I didn’t get as far as passing the VCAP4-DCD). Hooray, I passed! Unfortunately I don’t live very near any exam centres that were offering slots for one of VMware’s 4-hour Advanced exams so I had to drive over to Milton Keynes to QA’s training facility there. If you choose to take an exam there and, like me, have to drive there make sure you leave yourself plenty of time as parking wasn’t straightforward. The facilities, the exam station itself was fairly decent. The screen size was bigger than I’ve seen in some other places and the workstation was pretty nippy. I’m tempted to go back there as and when I do my DCA exam. The exam itself, as I’m sure you’ll read elsewhere, is 3 hours and 45 minutes long and is comprised of a mixture of multiple choice type questions, drag and drop questions and some Visio-like diagramming tasks. What made it quite a challenge was that, unlike with some other exams, you cannot return to a previously answered question, you can’t flag a question for later review. I found that this made me very conscious of time passing. I was torn between making it through all of the questions by submitting some hasty answers – some of which I know I will have got wrong through not ready the question through carefully – and taking my time thus risking leaving some questions unanswered. In the end, I finished with mere seconds to spare so I either judged it right or just got lucky! I can understand some of the reasoning behind removing candidates’ ability to review answers but I found some of the questions were curiously worded and, with some questions, I wanted to go back and check it almost as soon as I’d moved on. In a way though, I’m glad I couldn’t because I almost certainly wouldn’t have finished. In the end, it doesn’t matter too much because I’ve passed now but I wouldn’t say that I enjoyed the experience. I’m very happy about the result though! It’s been just over a month since TrainSignal switched to providing their courses only via an online model and binned the idea of shipping DVDs around the world. Although they kept their plans under wraps fairly well (at least they did as far as I know), it shouldn’t really have come as a surprise to anyone that they changed their model. You only have to look back another month or so to one of the UK’s big high street names going to the wall to see further evidence that physical media is just not as popular anymore. I had been planning to purchase one of TrainSignal’s courses just prior to them making the switch. Good job I waited eh? But after giving it a week or so to bed in, I subscribed and I now have access to the whole training catalog. Logging in, the dashboard (below) gives you the ability to browse and take courses, take practice exams, see what’s new etc. You can see my progress having a look at David Davis and Jake Robinson’s “VMware vCloud Director Essentials” course. There’s also a link that will let you download the Silverlight based offline player. The offline player, as it says on the tin, allows you to download courses to view when you don’t have an internet connection handy. It requires you to authenticate using your TrainSignal account and you’ll need to connect the player to the internet every few days or so for it to re-authenticate. Once in, you can browse the course catalog and select courses for download. The player’s fairly responsive and I’ve had no issues with it… save one. As stated on their website, TrainSignal do not yet offer an offline player for mobile devices (e.g. iPads etc). For me, that’s a bit of a detractor. Overall, I like what TrainSignal have done. I can pick and choose whichever courses I want and hopefully the catalog will grow nicely. I do want an iPad app for it though! Note: I didn’t clarify when I first wrote this that TrainSignal have offered their courses online for some time but not as a subscription model. Thanks to Ricky El-Qasem. The first ever TrainSignal course that I “took” was David Davis’ VMware vSphere 4 training. I had heard lots about it from a few people on Twitter and several others in person and I wanted to use it to fill in a few gaps in readiness for my VCP4 exam. I’ve since been through a few other courses and they’ve all been great. What’s changed between then and now is TrainSignal’s transition from supplying only DVDs, through adding online access to purchased course, to finally switching to a subscription only model. It’s a move that makes a great deal of sense and it’d be worth a subscription to get access to course related to technologies that I don’t use as often. There is even an offline player but it’s currently limited to desktop computers (Windows / OSX). One thing that I would like to see though is a way to view courses offline on mobile devices. I recently used Handbrake to transfer my copy of Scott Lowe’s Designing VMware Infrastructure to my iPad so I could work through it anywhere. At about 800Mb though, I would only want to download that ahead of time and not via 3G when on a train. Still, good move TrainSignal. I like it.